Yesterday was a very special someone’s birthday…and this very special someone’s favorite cake happens to be of the carrot variety. So obviously I knew, early on, that come September when his birthday rolled around, I’d be making a carrot cake for whatever festivities unfurled, but then I kind of shot myself in the foot when, back in July during one of his particularly stressful and unrelenting work weeks, I decided to bring him a slice of carrot cake as a mid-day surprise. For some reason, I totally took this idea and ran with it — leaving early for work so I’d have time to stop at New Seasons and pick out a yummy slice, spending half an hour at work figuring out the best way to wrap it up like a present while keeping it protected from the elements should he not discover it immediately (slow day working at a yarn shop in July, anyone? ), putting a “back in five minutes” sign on the door and closing up shop to cruise over to his job site (which I just happened to know the location of because I’d stopped by in the middle of a run for a quick hug a few weeks prior), parking on the opposite side of the block so he wouldn’t be able to spot my car, hiding in the bushes outside of his clients’ house while he measured and cut wood, until his back was turned just long enough tho scamper up the steps and drop the cake off on the porch. It was for sure one of the weirdest things I’ve done in awhile, and though enormously appreciated, I kind of inadvertently raised the bar with the whole birthday cake thing. So when I came across this recipe while surfing around food blogs, I bookmarked it and made a plan to return on Monday, September 26th, for my first ever attempt at baking a cake, for real. Dump 1/2 cup raisins and a few tablespoons of chopped candied ginger in a small bowl, submerged in your favorite bourbon. Let that sit for about an hour — in the meantime, you can prep the cake batter. Did I tell you I got a Cuisinart? It makes shredding 1 pound of carrots sooooo easy. I’m not usually much of a dry/wet ingredient separator, but hey, like I said, he’s a special guy. So two bowls got dirtied for this occasion. And then, incorporate this all together with the dry ingredients. Then, right at the end, mix in the shredded carrots, marinating raisins and ginger, and 1/3 cup chopped almonds. I only have one springform pan, so I ended up baking the two layers of this cake in separate rounds (at 350 degrees, for 25-30 minutes — or until the knife comes out clean, you know the deal). While that’s happening, you can make the frosting! Again, this is a job for the Cuisinart, and thankfully the carrots came first so it was super easy to rinse out and reuse for this step. The original recipe calls for 2 bricks of cream cheese, but I wanted to make sure there was plenty, so I multiplied everything by 150%. This was not necessary. Not to say that anybody complained when I deposited 3 extra tubs of the colored frosting on the low coffee table at Blitz with a pile of forks as the cake was being served, but still. Not necessary. I’ll give you the standard measurements. I got really into this whole making a cake thing and even ordered a cake decorating set to really get fancy. Unfortunately, being my first go-round with frosting making, (and probably not helped by the liberal bourbon ratio), this turned out more like icing, and a little too runny to hold any of the cool shapes. Nevertheless, I divided the frosting into thirds, and used some old school food coloring to get some green and orange going on. After both cakes were out of the oven, I stacked them up with wax paper between and put them (and all the frosting) in the fridge to cool overnight. The next day, I frosted the cake, starting with the middle, between the two layers. 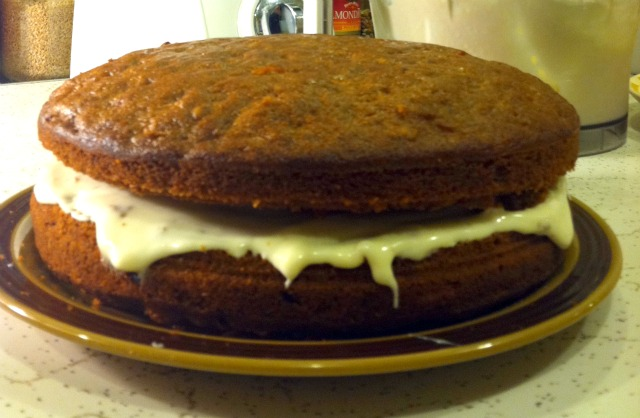 I was kind of stressing out about how to transport this cake to the bar, especially with the runny icing and all. But get this — did you know they sell cake boxes for $1 at New Seasons? I got one that was just a little bigger than the diameter of the pan I’d baked the cakes in, and then iced the cake on one of my plates that was a little too big for the box, so that it would keep the sides bowed out. At the very end, I toasted some coconut on the stovetop, let it cool, and sprinkled it on top in the vast white spaces. Thumbs up to Blitz for being so helpful with the secretive cake storage, and for turning a blind eye when I brought in my own little extra jar of bourbon marinated raisins and ginger to spoon on top of each slice at serving time.